As the teams go away to start crunching through the data collected from pre-season testing, data junkies amongst us can only wonder at what riches they have to play with. And how we can get started playing with some of it. While there have been some related initiatives - a race strategy worksheet from McLaren dating back at least to 2010, and the first challenge in the recent Tata Communications F1 Connectivity Innovation Prize to find novel uses for live timing data - I think there is great potential for F1 to help innovate, educate and engage far more widely in the currently hot-topic areas of data science and data visualisation. Whilst the data available to F1 stats fans may be limited, there is data out there, and we can play with it using tools that are perhaps no less sophisticated than some of the tools that the teams work with on a daily basis. 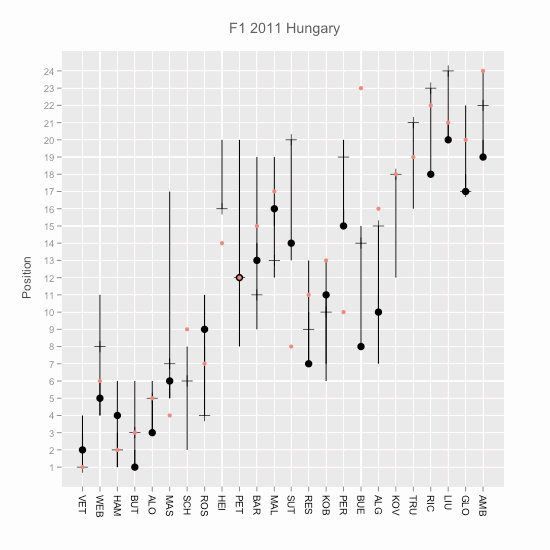 For several years, I have been playing with data from the openly licensed Ergast motorsport results database using R, an open source statistical programming language with a huge range of community supported libraries and toolkits and industrial reach (for example, Microsoft recently acquired Revolution Analytics, a company that provides enterprise level support for R-based data analysis). Long time Sidepodcast readers might even remember some examples from posts such as Statistics and analysis from the F1 Data Junkie where I produced a chart that tried to summarise key elements of specific races to help Mr C's failing memory when doing race updates! To try to pull together the various experiments and data sketches I'd been dabbling with, I started working on a book part way through last year using the Leanpub publication platform. From the consumer side, Leanpub provides a storefront for ebooks in a range of formats (pdf, epub, mobi) and a novel payments system: publishers define a minimum price (which could be as low as $0) and a recommended price, but it's up to the buyer how much they actually pay (as long as it's at least the minimum price). When a consumer buys a book, they actually gain the ability to download the current state of the published book for as long as the author continues to publish updates. The platform also provides an opportunity for the technical author to explore new workflows: the manuscript is provided as one or more Markdown documents or HTML documents. In my case, I use an environment called RStudio to write "R markdown" documents that let me blend prose with R programme code, which can automatically produce output code and charts that can be passed straight to Leanpub. Finally, in addition to automatically generating and publishing the final e-book, you can also bundle in code downloads (I'm trying to put together a prebuilt virtual machine, for example, containing the RStudio environment, sample code and example data files so readers can play along too). "What has all that got to do with Formula 1? ", you might well ask? The answer is simple: It's an innovative, efficient and effective workflow that I have been prompted to explore through my engagement with Formula One and the compulsion to innovate that it is associated with, an ethos also reflected by Mr C's Sidepodcast website developments and Christine's publishing adventures. Innovation is the lifeblood and ethos of F1. Every area of the business is up for grabs if it can be improved. Even task planning and inventory management, if Microsoft Dynamic's sponsorship of Lotus and the provision of their Enterprise Resource Planning suite is anything to go by! 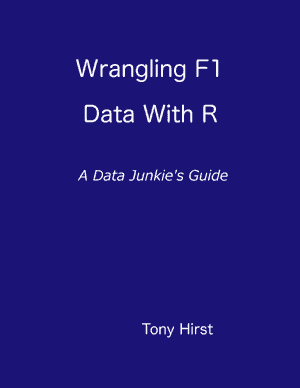 I also hope that somewhere along the line, other F1 data junkies and stats fans may find something of use in it, (or prompt them to send me corrections!) and encourage other F1 fans in general to start exploring new data related technologies either using F1 data or data of their own. A free preview of several chapters of the book are also available from LeanPub.